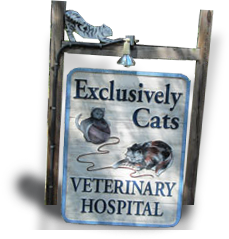 At Exclusively Cats Veterinary Hospital, our clients all have one very important thing in common—they want what’s best for the special kitties in their lives. We believe in partnership—we work closely with cat parents to ensure that their feline family members are obtaining everything they need to achieve optimal feline health. Whether you have a new kitten, a healthy adult cat, or a senior cat, we have the knowledge and experience to address your feline’s unique needs. Kitten care—Discover why your new family member should pay us a visit as soon as possible after coming home with you and learn how to equip your cat for a lifetime of good health. Feline wellness & behavioral services—We’re experts at preventive veterinary care and skilled in explaining why felines do what they do, serving as a resource to eliminate any unwanted behaviors. Senior cat care—Learn which symptoms and behaviors to look for in your senior cat and learn about steps to keep his or her senior years happy and healthy. In the course of sharing our lives with our feline friends, our cats may become sick. Learning to recognize signs of illness and seek out the services of a good veterinarian is critical to your cat’s well-being. You may be called on to nurse your cat at home. Having a “sick kid at home” can be stressful. Yet your role in the healing process is vital, since you share the deepest bond with your feline family member. The American Association of Feline Practitioners has produced an excellent collection of resource information that will boost your confidence about providing at home Nursing Care for Your Cat. We’ll partner with you to provide the best treatment possible for cats troubled by complex veterinary issues. If your cat is terminally ill, we will guide you through hospice care, which delivers comfort care to cats nearing the end of their life and emotional support for the humans who love them. If you would like to obtain additional information about a variety of feline health issues, please peruse our own cat care resources. Should you have any questions about your cat’s health, please don’t hesitate to contact us. We are always available to help you with your veterinary needs.